Michal Mael set to stun at Tucson Gem Show. This year's collection includes the largest Amethyst geode in the world at more than 16 feet tall and weighing 17,600 pounds. Taking the crown from the "Empress of Uruguay" the world’s previous largest geode. Coming in at more than 16 feet tall and weighing in at 17,600 pounds. Michal Mael, better known as the ‘Queen of Rocks’ has traveled all over the world on a mission to find the most stunning and valuable geode rocks to create interior and exterior decor that brings positivity and abundance to her client’s lives. Her travels have taken her to exotic destinations like Brazil, China, Bali, and Israel. Michal & Company is excited to be an exhibitor at the Tucson Gem Show for the 23rd year in a row. This year’s collection includes the largest geode in the world at more than 16 feet tall and weighing in at 17,600 pounds. Taking the crown from the “Empress of Uruguay” the previous world’s largest Amethyst geode. Not stopping there, their 130-sq. ft. exhibitor tent is filled with gorgeous crystals, gems, minerals, and geode rocks brought in with 20 semi-truck loads. Labeled by show spectators as the biggest and most impressive haul to date. 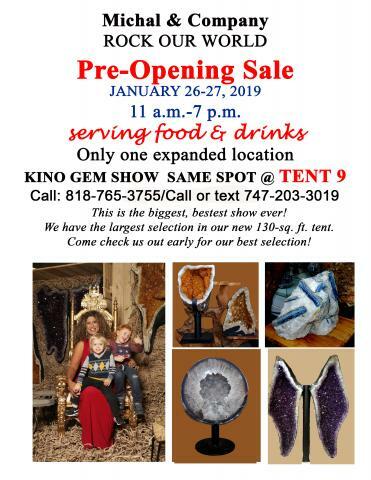 Additional standout pieces include a fabulous geode that weighs 5 tons, and an Amethyst plate naturally shaped like a heart, the largest in Tucson ever, standing at over 8 feet tall and 8 feet wide. “The rest of the collection is a surprise, but if you think the rocks we featured last year were big, you should see what we have waiting for you in our tents!” says Michal Mael, CEO, and Founder of Michal & Company. As the first single female in the world to directly import geodes into America, she has definitely proven herself to be one of the best at the largest gem show in the world. This is a spectacular opportunity to showcase Nature’s Art Décor, which is her unique system of turning nature’s geodes into a stunning home and office design pieces. Not only is Michal one of the most prosperous geode importers in the world, but she is also a dedicated single mother of twin boys who have literally rocked her world in ways she could never have imagined. Michal believes in giving back to the community and is raffling an amazing Amethyst Geode worth $3000.00 to benefit RideOn.org which is a foundation supporting disabled people through horse therapy. The winner of the raffle will be announced on February 17th, so good luck to all who buy tickets. Michal is truly one of our leading experts in the metaphysical world, and one of the top designers in creating Nature’s Art Decor in the home and workplace workspace. Michal and Company sell one of a kind pieces to galleries, high-end boutiques, museums, interior designers, casinos, hotels, and VIP clients. In addition to the booth and mail order options, they also have a year-round warehouse of rocks, crystals, and décor in North Hollywood, Los Angeles.